March is over already, and we’ve had a lot of updates, mostly in the form of Google changes. 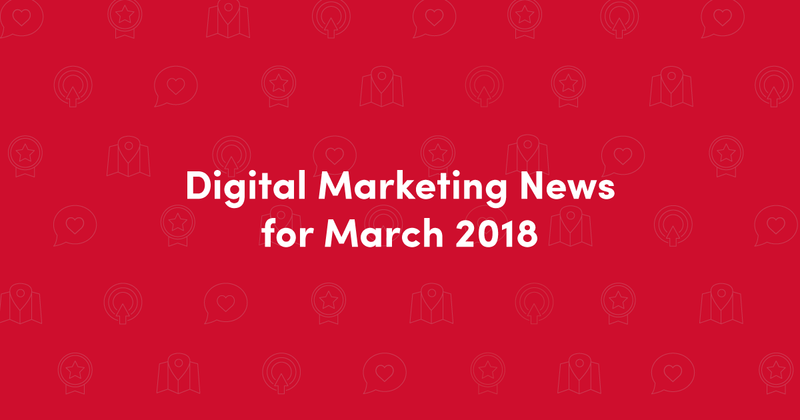 Read on to learn the latest digital marketing news that will affect your business in the coming months. Google is allowing businesses to add a description to their Google My Business listing again. Google used to let businesses add a description to their listing, but the search engine removed descriptions a while back. The description field is now back as Google rolls this option out to more and more listings, so make sure to add your business description or talk to your marketing strategist about this. Before you do, though, there are guidelines you’ll need to follow. Read the Google help article and guidelines for adding a description to your business’s Google My Business listing here. Once you add the description, it will show up in either the local knowledge panel or the map result for your business’s listing. Facebook is shutting down partner categories. Partner categories in Facebook ads used to give businesses the option to target people based on things like purchase history. Facebook got this data from third-party providers, and the social network is removing this ad targeting option as a way to improve its data security. If you’re a RevLocal client and you’re running Facebook ads, this probably won’t affect your ads much, since we tend to use other targeting methods to help expand your Facebook ad reach while maximizing your budget. If you have questions about this, please contact your marketing strategist. Google is now rolling out its mobile-first index, so make sure your site is ready! We talked about this in last month’s news roundup, so you can read more about it here. Google is allowing OpenTable reservations right in your restaurant’s Google listing. We have a full article about this, so check it out if you want to learn more about how people can now book OpenTable reservations directly from your Google listing, saving them a step and making it easier than ever to book a table! The option doesn’t seem to be available for all restaurant Google listings, but this may just be because the restaurant doesn’t have an OpenTable account. Check out our social media webinar to learn how to get more followers and improve engagement. Have you seen our brand new (free!) guide about growing your business with digital marketing? Download Your Local Business Guide to Digital Marketing here. There’s no commitment, just a free, full eBook that will teach you how to get started with or improve your digital marketing. Our top blog post for the month is 3 Easy Ways to Improve Your Facebook Relevance Score. Read the full article to learn how to get the best reach and make the most of your Facebook advertising budget. Our newest blog post is all about the cost and ROI of billboard marketing vs. the cost and ROI of digital marketing. Spoiler alert: billboards are expensive. Shameless plug: Don’t forget to subscribe to our YouTube channel for all the digital marketing news updates you’ll need to know in the coming month!